Is Intuit Inc. (INTU) A Good Stock To Buy? Hedge funds are known to underperform the bull markets but that’s not because they are bad at investing. Truth be told, most hedge fund managers and other smaller players within this industry are very smart and skilled investors. Of course, they may also make wrong bets in some instances, but no one knows what the future holds and how market participants will react to the bountiful news that floods in each day. Hedge funds underperform because they are hedged. The Standard and Poor’s 500 Index returned approximately 13.1% in the first 2.5 months of this year (including dividend payments). Conversely, hedge funds’ top 15 large-cap stock picks generated a return of 19.7% during the same 2.5-month period, with 93% of these stock picks outperforming the broader market benchmark. An average long/short hedge fund returned only 5% due to the hedges they implement and the large fees they charge. Our research covering the last 18 years indicates that investors can outperform the market by imitating hedge funds’ stock picks rather than directly investing in hedge funds. That’s why we believe it isn’t a waste of time to check out hedge fund sentiment before you invest in a stock like Intuit Inc. (NASDAQ:INTU). Intuit Inc. (NASDAQ:INTU) investors should be aware of a decrease in activity from the world’s largest hedge funds recently. Our calculations also showed that INTU isn’t among the 30 most popular stocks among hedge funds. We’re going to analyze the latest hedge fund action encompassing Intuit Inc. (NASDAQ:INTU). 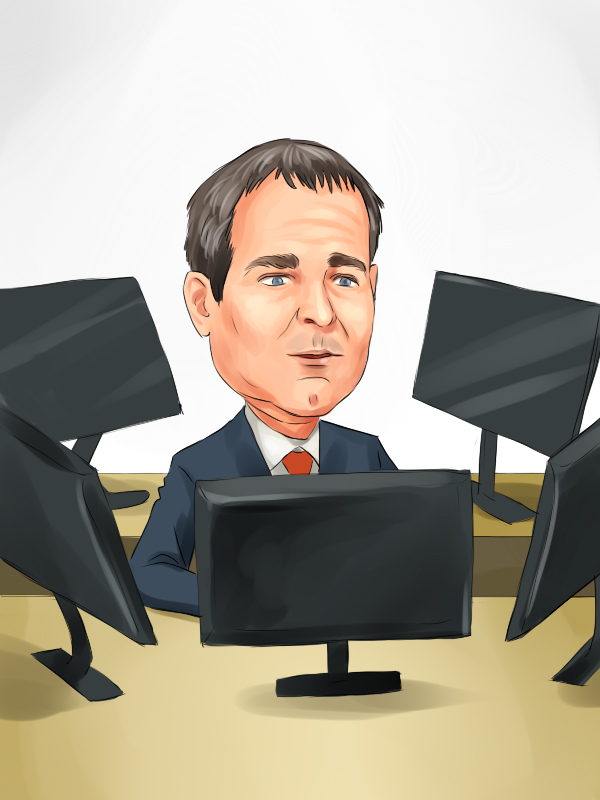 What have hedge funds been doing with Intuit Inc. (NASDAQ:INTU)? Heading into the first quarter of 2019, a total of 39 of the hedge funds tracked by Insider Monkey held long positions in this stock, a change of -9% from the second quarter of 2018. 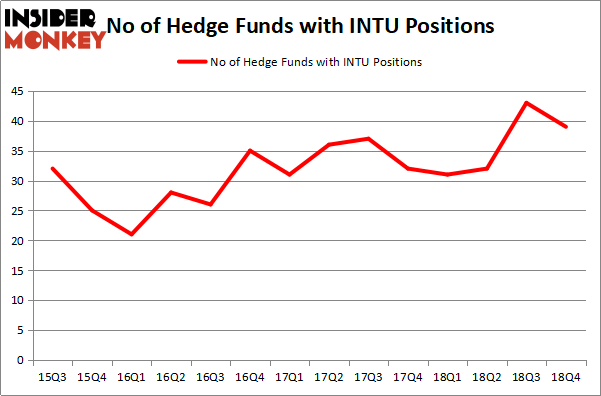 On the other hand, there were a total of 31 hedge funds with a bullish position in INTU a year ago. With hedge funds’ positions undergoing their usual ebb and flow, there exists a few key hedge fund managers who were increasing their holdings meaningfully (or already accumulated large positions). Of the funds tracked by Insider Monkey, AQR Capital Management, managed by Cliff Asness, holds the largest position in Intuit Inc. (NASDAQ:INTU). AQR Capital Management has a $453.8 million position in the stock, comprising 0.5% of its 13F portfolio. The second most bullish fund manager is Arrowstreet Capital, led by Peter Rathjens, Bruce Clarke and John Campbell, holding a $319.6 million position; 0.8% of its 13F portfolio is allocated to the company. Some other professional money managers that are bullish comprise Ken Griffin’s Citadel Investment Group, Noam Gottesman’s GLG Partners and Brandon Haley’s Holocene Advisors. Seeing as Intuit Inc. (NASDAQ:INTU) has witnessed declining sentiment from the smart money, it’s safe to say that there were a few money managers that decided to sell off their entire stakes in the third quarter. It’s worth mentioning that Jim Simons’s Renaissance Technologies sold off the biggest position of the “upper crust” of funds tracked by Insider Monkey, comprising an estimated $109.7 million in stock. Joel Greenblatt’s fund, Gotham Asset Management, also dumped its stock, about $64 million worth. These transactions are important to note, as total hedge fund interest was cut by 4 funds in the third quarter. Let’s now review hedge fund activity in other stocks – not necessarily in the same industry as Intuit Inc. (NASDAQ:INTU) but similarly valued. We will take a look at EOG Resources Inc (NYSE:EOG), Schlumberger Limited. (NYSE:SLB), Boston Scientific Corporation (NYSE:BSX), and Deere & Company (NYSE:DE). This group of stocks’ market values are closest to INTU’s market value. As you can see these stocks had an average of 45.5 hedge funds with bullish positions and the average amount invested in these stocks was $1566 million. That figure was $1755 million in INTU’s case. Schlumberger Limited. (NYSE:SLB) is the most popular stock in this table. On the other hand EOG Resources Inc (NYSE:EOG) is the least popular one with only 37 bullish hedge fund positions. Intuit Inc. (NASDAQ:INTU) is not the least popular stock in this group but hedge fund interest is still below average. It seems like hedge funds dropped the ball on Intuit as the stock significantly outperformed the market. Our calculations showed that top 15 most popular stocks among hedge funds returned 19.7% through March 15th and outperformed the S&P 500 ETF (SPY) by 6.6 percentage points. Some hedge funds were also right about betting on INTU as the stock returned 31.9% and outperformed the market by an even wider margin. Itau Unibanco Holding SA (ITUB): Are Hedge Funds Right About This Stock? Were Hedge Funds Right About Buying United Technologies Corporation (UTX)? Were Hedge Funds Right About Dumping Twenty-First Century Fox Inc (FOX)? Hedge Funds Have Never Been This Bullish On Thermo Fisher Scientific Inc. (... Were Hedge Funds Right About Buying Costco Wholesale Corporation (COST)? Do Hedge Funds Love Diageo plc (DEO)?